Stocks Unleashed: ASX: Frontier Resources Ltd (FNT) – Moving into the next Frontier soon! ASX: Frontier Resources Ltd (FNT) – Moving into the next Frontier soon! 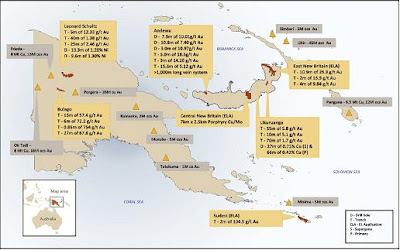 FNT has been around the mining picture for a long time in PNG.In fact, they were very close to start developing a world-class project back in 2008…until the Australian Govt interfered by influencing PNG Govt to not renew FNT’s exploration lease as their deposit is very close to the Kokoda Track. Their indicated & inferred resource at that time was proven to be 213.6MT @ 0.51% Cu Equivalent (1.08Mt Cu Eq). FNT owns all the rigs that are being used for drilling. FNT also operates the drill rigs by themselves. This is a cheaper way of drilling, considering that they can side-step all the troubles and higher premium that come with contracting others to perform drilling for them. That being said, for them to test deeper targets (up to 800m), they may have to either modify their existing rigs or to charter some other rigs to get the job done. In most recent announcement, FNT spent ~$1.55M cash over past half-year ending 31 Dec’10 with ~$2M. Spending at this rate, this means that FNT has enough cash to last them to about Jun’11. Considering that they’ll be drilling at Andewa, they’ll need cash injection (via capital raising) to continue on with their operations. By releasing the 5000 rock chip samples from Andewa (promised to be done by end Feb’11 but not released yet), assuming that they will be good results, they will provide a lift to the current share price, and hence be to raise capital with less dilution to existing shareholders. Also, FNT had secured a very good deal with Ok Tedi in that Ok Tedi has the option to earn 58% of Bulago and Leonard Schultz JVs and up to 80.1% of Likuruanga, Central; East New Britian JVs by spending US$12 million in each of the project within 6 years. This means that the drilling costs can easily be covered by Ok Tedi without the need to raise capital to drill these target areas. The only drilling costs that FNT would need to raise is for Andewa project and for the other suite of projects in Tasmania, Australia. FNT’s boss, Peter McNeil had spent his past 27 years in PNG. Some of the PNG national crews he currently has had been with him from the beginning of this company. With someone who’s been inside for past 27 years, I would think he’s got quite some insights as to how to best operate within PNG. In addition, the JV with Ok Tedi will allow it to have access to many influential people within PNG as Ok Tedi is mostly owned by the PNG people. OK Tedi’s involvement as a JV Partner Ok Tedi hosts a world-class copper mine, directly employs 2000 people, and had been producing for 20+ years. OTML's shareholders are PNG Sustainable Development Program Limited, (52 per cent), Inmet Mining Ltd (18 per cent) and the PNG Government (30 per cent). The PNG Government holds equity directly (15 per cent) and on behalf of the Western Province (12.5 per cent) and landowners from the mine area (2.5 per cent). Considering that Ok Tedi’s mine is going to be shut in 2013 (with a potential for mine-life extension to 2022 that’s still in feasibility phase), they would be quite desperate to find another world-class mine to keep them in business. So far, Ok Tedi has only FNT as its JV Partner in prospecting for more resources. In one sense, Ok Tedi has all its eggs in one basket (i.e. FNT)!! Now, why would a world-class producer who had been operating for ~25 years, when facing an ‘extinction’ threat, bet the future of their company on one company, i.e. FNT? They must have very strong reasons to do so. And considering the results they’ve got in Bulago so far, it’s not a surprise that they have a higher priority to drill it in Apr’11 (5000m drilling program planned). The share price of FNT had gone up from $0.07 back in Nov’10 to a high of $0.42 in Feb’11 (due to speculation that very good results shall be released from the Andewa’s 5000 rock chip samples). This is a highly active and volatile stock with speculators watching with eagle’s eyes, keen to exploit its potential. It is not a share for the faint-hearted! With drilling upcoming in April on both Andewa and Bulago projects, I believe that there will be huge upside to the share price as the drilling results are released in 2Q’11. If speculation on Andewa’s results was sufficient to push the share price to $0.42, with definite results from both Andewa and Bulago (which I’m quite confident that they’ll bode well), $0.50 is not an impossible target to reach. With Peter McNeil giving a presentation next Wed in Melbourne (23 March), it’s quite likely that he’ll be talking about the plans for the drilling programme in Apr’11. And quite likely, he may release results from Andewa’s rock chip samples prior to his presentation, this will cause excitement amongst the investors and will push the share price up. FNT is a highly prospective junior explorer, a quite stable company from the perspective of having a very good world-class JV Partner who’s offered to pay for drilling costs for up to 5 of the JV areas and providing their own drilling rig + sample results analysis, having a good Managing Director who has a lot of experience in PNG, owns its drilling rigs with low-cost drilling crews, and having a diversified portfolio that have high-grade gold mineralization. If FNT manages to prove 1 out of the 3 potential world-class mines (Bulago, Andewa and Leonard Schultz), this will transform FNT to become a stakeholder in a potential world-class gold mine. Its shares won’t be worth 25 cents anymore. FNT is moving to the next Frontier soon as the drilling program starts in Apr'11. Of course, if it manages to prove that it's got 3 world-class mines, this share would certainly be worth a few dollars. 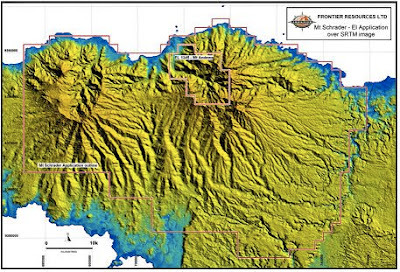 This can be a potential Lihir Gold in the making (taken over by NewCrest for $9.5B)! Note: The projects within Australia have not been mentioned so far as I see them as peripheral projects that FNT owns. The main flagship projects for FNT shall be the PNG projects, which will bring much more significant cashflows to FNT. However, if FNT manages to discover more resources in Tasmania, that will be a bonus to the share price.